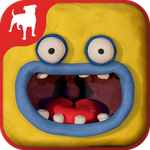 Partnered with Fat Pebble, Zynga officially launched Clay Jam for iOS and Android today, bringing to market a game made entirely of clay. Charged with the mission of saving the land of Clay Jam, players control a ball of clay called Fat Pebble as he rolls down hills collecting clay, avoiding obstacles, and maneuvering about using a "gouge control system." Clay Jam, which has plenty of hills to roll down and unique hand-built monsters to encounter, is free to play, with optional in-app purchases to "save Clay Jam even sooner." The real story, though, is the impressive thoughtfulness and craftsmanship behind the game.